Over the years, many developers have experimented with mixing pinball mechanics into other genres, with examples including Pinball Quest, Odama, and Rollers of the Realm. 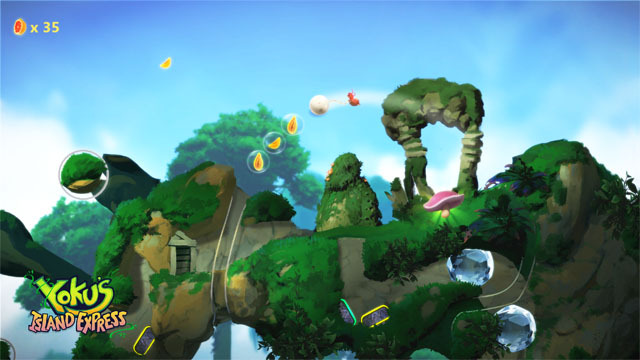 Developer Villa Gorilla aims to do the same with Yoku's Island Express, an open world action adventure starring a dung beetle named Yoku who has recently accepted the role of postman on a tropical island. The dung beetle's ball acts as the game's pinball, with the beetle tethered to it, letting out cute squeaks and flailing about whenever the ball is launched. The player must use flippers to knock the ball around, bouncing it off of bumpers, activating switches, and breaking environmental objects in order to move across an array of themed environments. Along the way, he interacts with NPC's, goes on quests, and contend with giant creatures spread across the land. The game is now available on PC via Steam, Switch via eShop, Xbox One via Microsoft Store, and PS4 via PSN.